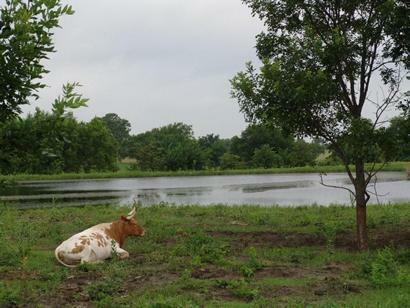 The Texas Longhorn Cattle: Shaped By Nature. Even city folks who can't tell an emu from a turkey can spot a Texas longhorn cow when they see one. There's no such thing as an Oklahoma longhorn or California longhorn. Longhorns are as Texan as it gets. Like the people who forged the state, the longhorn is a product of the land. 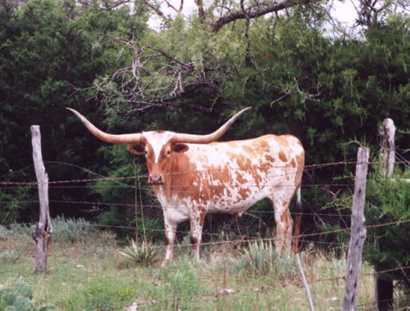 Or as Frank Dobie put it, "The Texas longhorn was bred not by man but shaped by nature and man benefited." Texans benefited the most. The longhorn is credited with lifting the state from economic ruin wrought by the Civil War and becoming the foundation of a vast cattle empire. 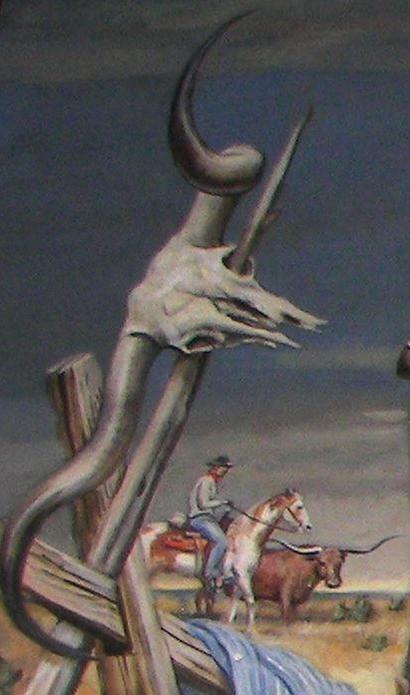 The longhorn gave us cattle drives and folk heroes we called cowboys. 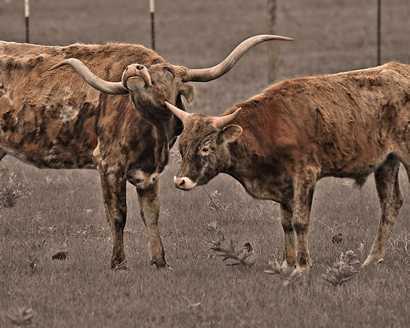 More than any other creature, the longhorn gave Texas an identity separate from the rest of the country. Other breeds of cattle, like the Hereford and Angus, were created by selective crossbreeding. The longhorn's evolution began in 1493 when Columbus made a return voyage to the New World and dropped off a load of Spanish cattle at Santo Domingo. 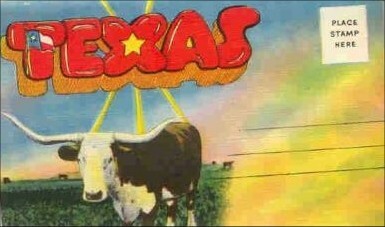 A couple of hundred years later cattle were driven across the Rio Grande into Texas to provide meat for the missions. By the time of Republic of Texas, wild cattle roamed all over the state, as wild as buffalo or bear or any other creature eking out a hardscrabble existence from an often unforgiving land. English cattle were brought here by some of the early settlers, but some of those cows wandered off or were chased off by Indians. The various bloodlines contributed to what would become known as the Texas Longhorn, a creature every bit a match for the state that created it. "Tex is approx. 1200 lbs with a horn spread of 8' 1" (including the curl)." 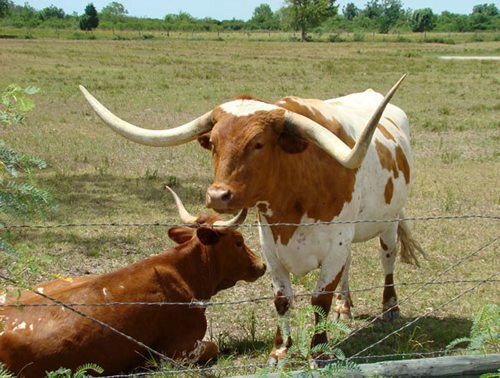 Historian Joe B. Frantz wrote of the Longhorns: "They were built for travel, because they had strolled their way a thousand miles from Vera Cruz; and they grew long horns because they had to learn to fight off predators in the brush. "In the days of the Republic of Texas and thereafter they cross-bred somewhat with cattle brought in from the Old South, which helped their beef content without destroying their mobility. "Like two-legged Texans, they operated best when left essentially alone, and they need looking after only at twice-a-year roundups - one for branding and one for slaughter." Their toughness and endurance made them perfect candidates for the fabled cattle drives out of Texas on the Chisholm Trail. They had long legs, hard hooves and endured hunger and thirst better than other breeds. Long-horns ate grass that other cattle wouldn't. 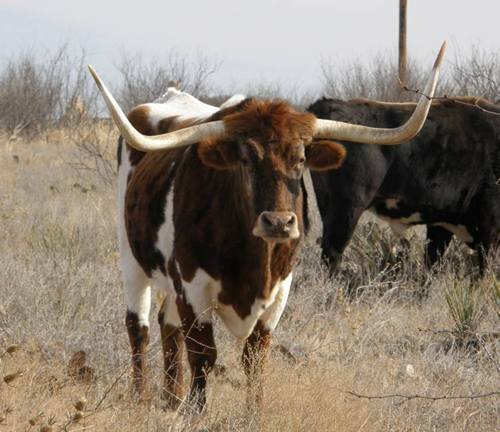 Cattle drives that would have decimated lesser breeds suited the longhorns just fine. Most even gained weight on the drives. Just as the gunslinger, Comanches, buffalo and Indian fighters had seen their day come and go, so it seemed to be with the longhorns. Barbed wire and the end of the open range made such tough and durable cattle not so necessary, especially after people started breeding them with Durhams and Herefords. 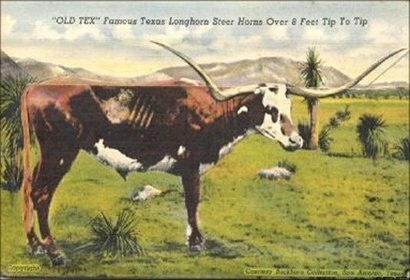 By the 1920s, the longhorn had been almost been bred out of existence. In 1927, the Forest Service collected a small herd of breeding stock and moved them to the Wichita Mountain Wildlife Refuge in - gasp! - Oklahoma. Small herds were gathered for state parks. Ranchers started buying them again. At first the longhorns were considered a novelty, a nostalgic throwback, but the breed's endurance, strong immune system, fertility and its ability to live on less than ideal pastures began endearing it to another generation of cattle men. The Texas Longhorn Breeders Association of America in Fort Worth has grown from an initial membership of 12 in 1964 into an organization with more than 5,000 members. "These impressive creatures will prosper on grass that other cattle could not survive, go without water for days on end, protect each other from harm, attend to a member of their herd that is sick or wounded, calve effortlessly and amaze you with their intelligence. But these are not the real reasons we are so fascinated with them. "The glint of sunlight off a crown of burnished horn, the profusion of bright earthy colors of a herd moving, the sights and sounds of the herd as it grazes, the fact they are just plain easy on the eyes, or the certain knowledge that you are in contact with a piece of Texas history, and any of these or all of these are why we are drawn to these gentle giants. "I know of no other breed that captures the imagination quite like longhorns do."